How the magnolia became a Southern symbol, I’ll never know. Sure, it thrives in warm, humid climates and has lovely blossoms that emerge this time of year to give the air a sweet and intoxicating aroma. But, let’s face it, this tree is a mess. It takes a special homeowner who can handle it. I am not that homeowner. Why do you lie there, mocking me? I have an admission: what some people call “discipline” in my lifestyle is more accurately diagnosed as a mild form of obsessive-compulsive disorder. The more chaotic my life gets, the more I focus on trying to control small components of it. Back during my newspaper days I wrote an entire column on how I enjoyed ironing. Yes, I know. I’m sick. The magnolia tree feeds that sickness like no other living thing, and this is the season of the year it taunts me the most. While every other non-evergreen drops its leaves in the fall, the magnolia sheds thousands of its “leaves” in the spring. 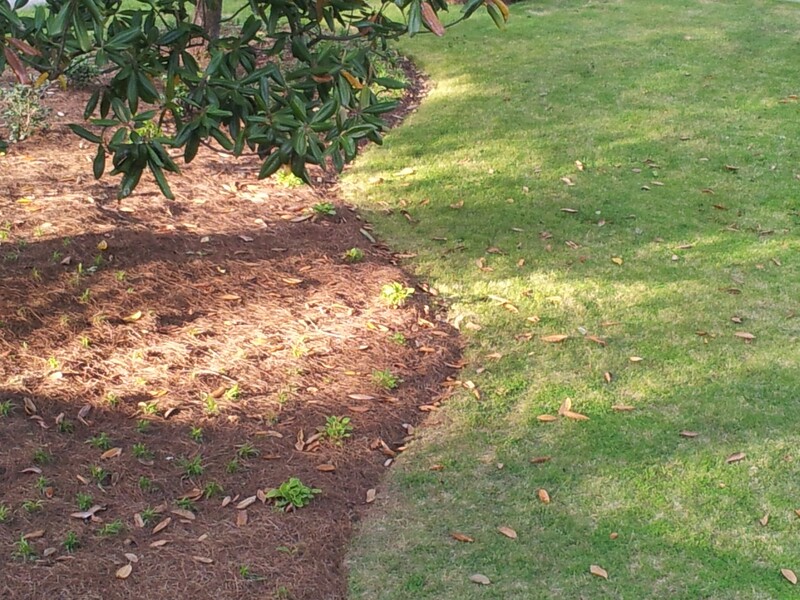 As my zoysia lawn finally begins to slowly go from brown to green, it gets covered in the ugly, brown and yellow shards of non-biodegradable cardboard that fall endlessly from the giant magnolia in my front yard. To make matters worse, this year Carla and I finally did what we should have done when we first moved into our Lilburn home nine years ago: we brought in a landscaping company. Instead of experimenting with plants that would end up dying or that we would replant to a more suitable location, we should have just bitten the bullet and had someone give us what we wanted. They completed the work two weeks ago, and as the greenery has started to take hold and the gardenias started to flower, the magnolia has begun its annual mischief. The view from upstairs bathroom window. Pardon me while I go down and get a few magnolia leaves up. When I gaze upon my lawn each morning, I have the urge to run out in my pajamas and start picking up leaves. It’s maddening. Last weekend as our oldest was getting his first shot at mowing the front yard, I helplessly watched as 20 mile-per-hour winds blew hundreds of leaves onto the pristine lawn. In the fall when my grass goes dormant, I don’t really feel a compulsion to get up the leaves that fall by the truckloads from my two giant silver maples. I usually wait until the week of Thanksgiving to begin blowing and raking, just in time to put up the Christmas decorations at the end of the week. But when the rest of the yard is blooming and greening and looking its best, the magnolia’s insidious littering drives me to distraction. Allow me to make a simple proposal: the New South needs a new symbol. You can make the case for the lovely but sometimes fragile dogwood. Atlanta’s Dogwood Festival at Piedmont Park was just last weekend, so it’s got a good following already. I would nominate the pine, but those continually falling needles and pine cones put it in the same annoying and high maintenance category as the magnolia. And don’t get me started about the Sweet Gum, with its prickly little balls that render a scamper to the mailbox hazardous. In the New South, we don’t have time to pick up after our trees. So, after much thought and deliberation, I humbly submit, the official tree of the New South should be the crape myrtle. Though many people hack it unmercifully, mistakenly believing it won’t bloom otherwise, this seasonal ornamental has become ubiquitous in recently developed areas of the South. It doesn’t require much, but it doesn’t give much in return. For good or ill, this sounds exactly like a New Southerner to me. What’s your favorite Southern tree? What’s your least favorite? Would you nominate something else as the quintessential tree of the New South? Leave a comment below to offer your perspective. This entry was posted in Uncategorized and tagged blossoms, contemporary South, crape myrtle, Georgia, Lance Elliott Wallace, Lance Wallace, landscaping, lawn care, leaves, Lilburn, magnolia, New South, New South Essays, NewSouth, pine, South, Southern, Southern Culture, Southern Living, Southerners, sweet gum, the South, trees, yard work. Bookmark the permalink. I’m just thankful you wear pajamas in case you do feel that urge! A new symbol, like finger streaks on a car window through thick yellow pollen? The magnolia was an enigma in Dallas. Used to see them all the time in Highland Park and the old parts of town. All the radio horticulturalists said they were impossible to grow in Dallas, then you’d drive by one. Struggling like you did with one in Dunwoody also made me crazy. But the blooms were beautiful! Sorry, Lance. I’m a magnolia fan. When I was in high school, I did some yard work for a couple from church. Although the leaves were annoying to bag up, I fell in love with the scent of the blossoms. You don’t see magnolia trees quite as often in Kentucky, so that’s one of the things I’ve enjoyed about moving south. I’m glad you spoke up in their defense! This is a safe space for ongoing dialogue. Besides, you must have a better grip on OCD than I do. We have a couple of small magnolias among our many hardwood trees, and they’re not too much bother. And I do enjoy their blooms.However, as I look out my front window, my right-side view is of the massively littered yard of my neighbor across the street. 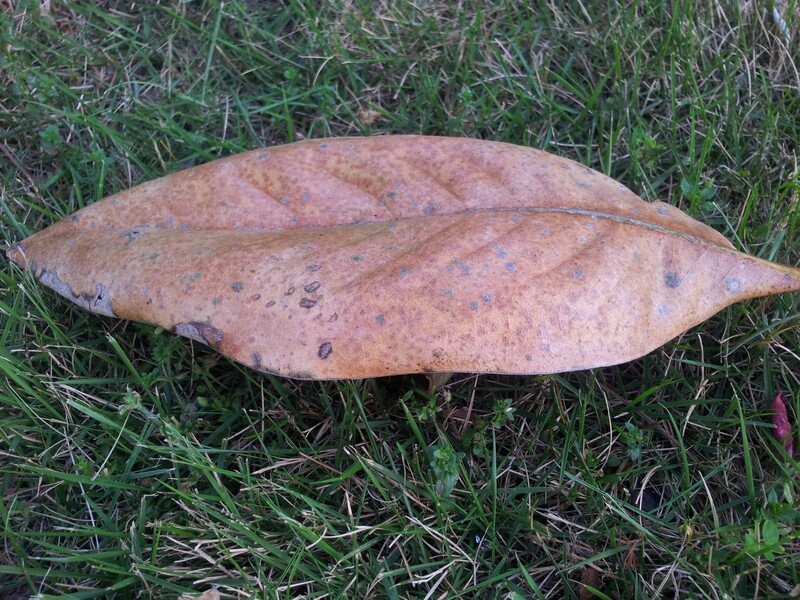 Apparently, the neighbor must like that yellow-brown carpet of magnolia leaves because he seldom mows or picks them up. And when it’s very windy, one guess as to where those leaves blow! Yipes! I had to park under a crape myrtle at our business (the landlord’s landscaper must have loved them) and when they bloom, their mess is equal to the magnolia leaves. In fact, I think I prefer blowing the leaves to cleaning off the hood and windshield of my truck every day for a month from the “crap myrtle” droppings. I never knew your blog had such power–my neighbor is at this very moment raking up his magnolia leaves–hooray! !